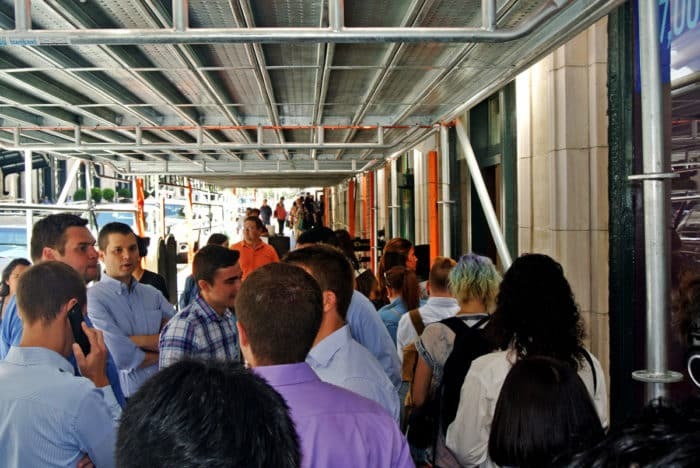 For my first visit, Amy and I walked over to the Montgomery location on a Monday just after noon and found ourselves immediately corralled into a snaking queue under metal scaffolding amongst an obvious hoard of young, blue button-downed banking interns. Clearly, this place regularly draws in massive lunch crowds — good for them — but is putting up with this mess worth it? 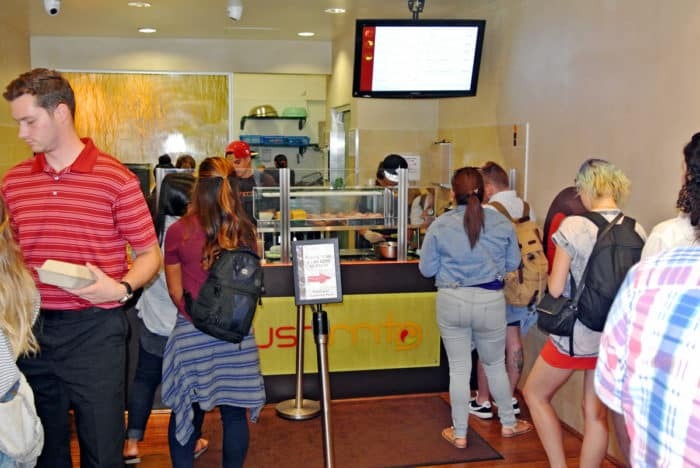 That long line leading into the diminutive shop looked daunting, but it actually moved faster than either of us expected and we had our sushi burritos in hand in under 10 minutes. They get 1 point for efficiency. Now is the point where I have to admit that I didn’t do my research leading up to this meal. 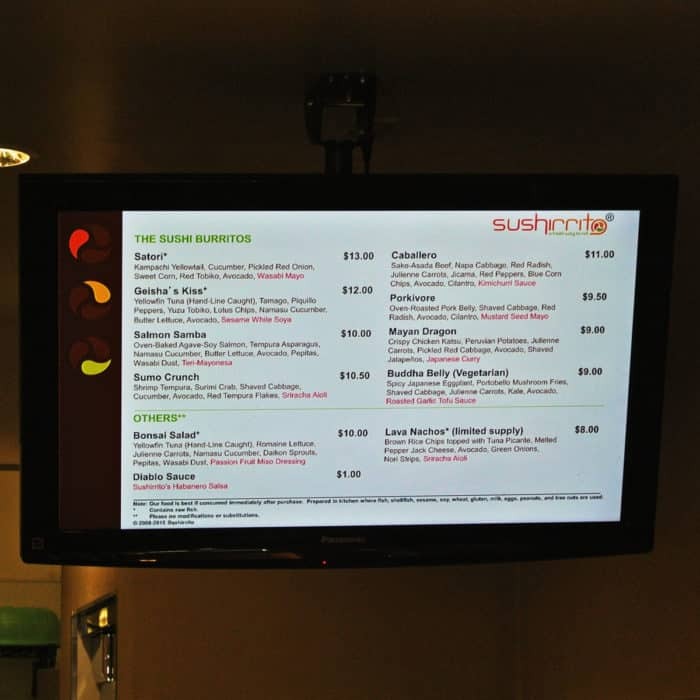 I hadn’t checked out the menu online beforehand, so I had to rely on the television screen hanging overhead to get a sense of their offerings to make my selection. I noticed that the first two preset sushirritos listed were brandished with asterisks — which I was surprised to learn indicated the use of raw fish. 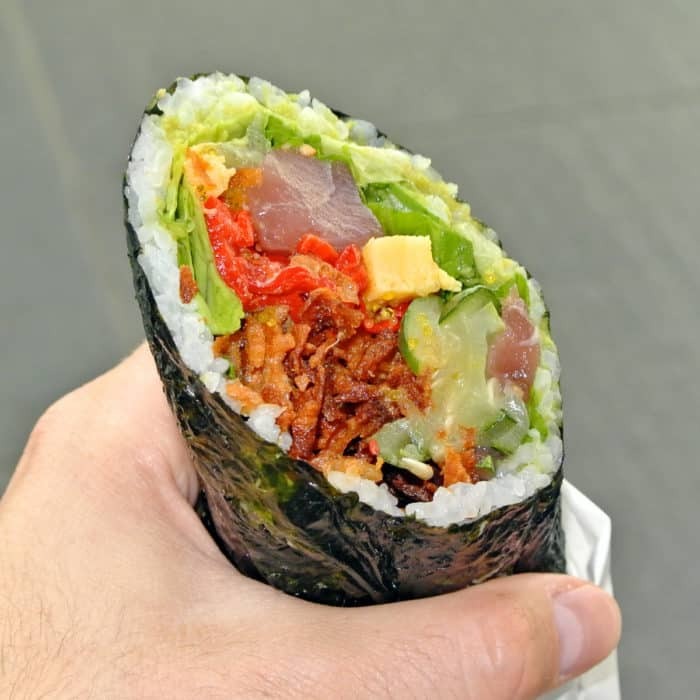 I was amazed and utterly flabbergasted to learn that only two of the eight supposed sushi burritos aligned with my generally universal definition of sushi — rice, seaweed, and raw fish. Instead, this fusion-filled menu featured rolls stuffed with atypical alternative proteins like ume-adobo style pork belly, sake-asada beef, and crispy chicken katsu. When I’m in the mood for sushi, I usually enjoy salmon (raw) and they do have salmon on the menu, but only an oven-baked agave-soy salmon. Shockingly, they don’t offer raw salmon at all. Sure, I’ve come across some unusual sushi riffs that stray far from the common formula and still ended up being impressive and delicious, but at this point, I was definitely suspicious. In any case, I selected one of the two rolls featuring raw fish (the kind of ingredient I expected to find in every roll) and hoped for the best. The roll I specifically selected was called the Geisha’s Kiss Roll and it was filled with a rather overwhelming sounding combination of yellowfin tuna, tamago, piquillo peppers, lotus chips, namasu cucumber, green leaf lettuce, ginger guac, yuzu tobiko, and sesame white soya sauce. From a visual and novelty standpoint, the jumbo sushi roll was actually pretty cool. It involved white rice pressed into a sheet a seaweed. 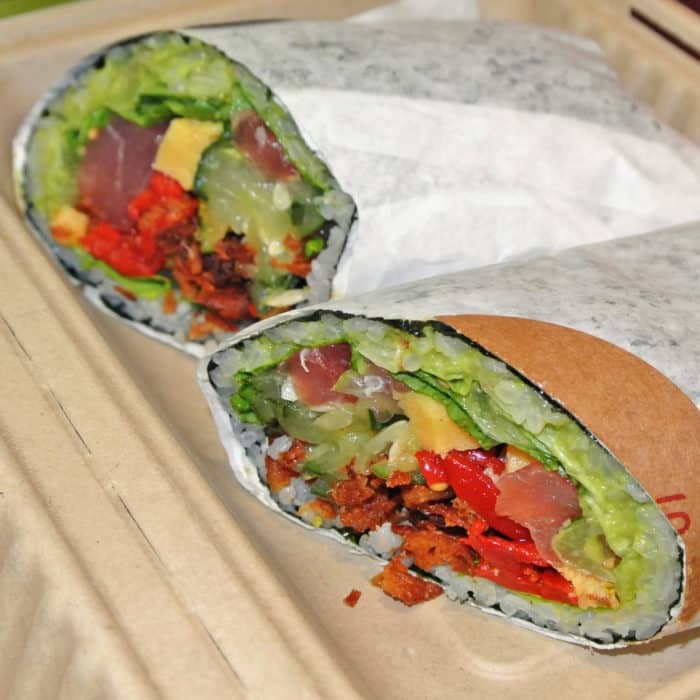 It was particularly girthy and held like a burrito cut in half on the diagonal – aka a wrap. It’s at this point I start to question what basic essential components are needed to claim that something is sushi. Likewise, a burrito. Sure this thing was physically the size of a burrito, it was rolled up, but the ends were left open – very un-burrito-like. Beyond that, every flavor and ingredient pointed more to its sushi-like nature, but even that was only a subtle nod to sushi. It’s like comparing processed cheeses like Cheez-Whiz and American Cheese slices to a well-aged Wisconsin sharp cheddar. Sure, they have a similar name, but are they really the same thing? I’d say no. I usually eat sushi to enjoy a light, refreshing meal featuring and highlighting extremely fresh raw fish – and not much else. My Geisha’s Roll did have a handful of large, red, raw tuna rolled up into the mix, but they were by no means featured to their fullest. They were mixed and masked by the melange of miscellany also mashed up inside that fauxrrito. It actually was pretty tasty, but its not exactly the light, clean, and fresh lunch I was seeking. Amy instead ventured away from the traditional raw fish direction entirely, opting for a Mayan Dragon Roll filled with fried chicken cutlets. This too was tasty, but certainly no better than a good curry-covered katsu cutlet platter or burrito. I think there are way better ways to spend $12 and get your fill of fried chicken and Japanese home-food flavors. 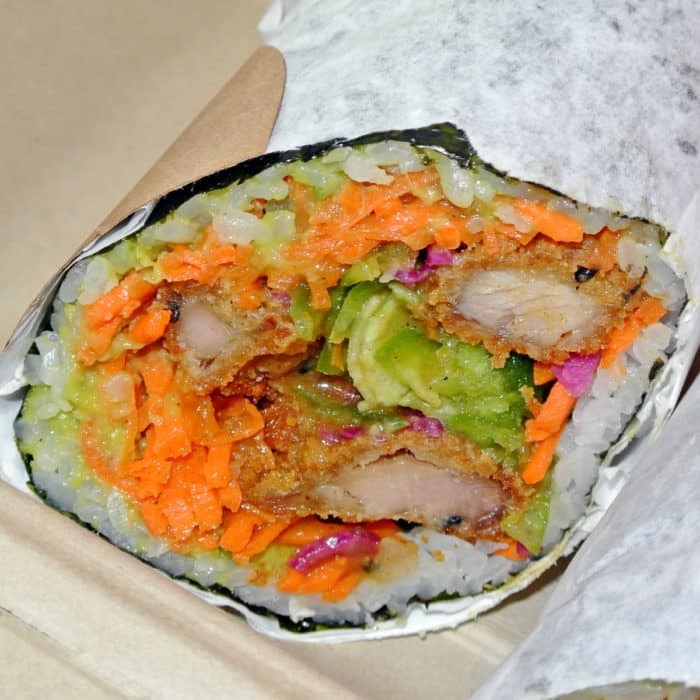 So, if I was in the mood for a burrito, would I go to Sushirrito? No, probably not. 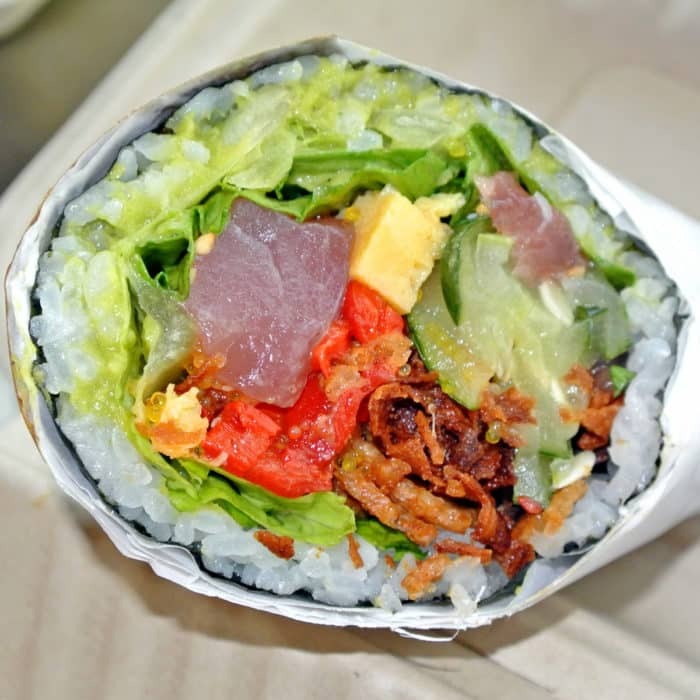 If I was in the mood for a sushi lunch, would I go to Sushirrito? No, also probably not. I don’t think one of these unusual creations would really satisfy either of those cravings. If I want a burrito, I’ll stick to a traditional one like I find at El Farolito (and for half the price). And if I want sushi, I’ll stick to any of my usual go-tos that feature and highlight their raw fish the way I expect and appreciate. 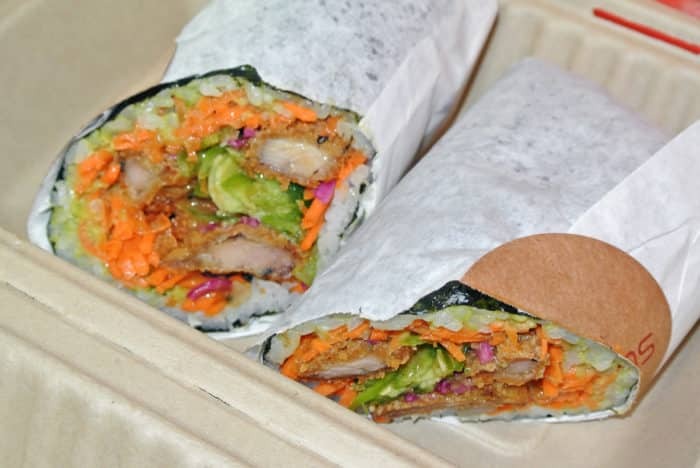 So, while Sushirrito may not be for me, I can understand why the Financial District suits choose to line up for it – they just don’t know any better.